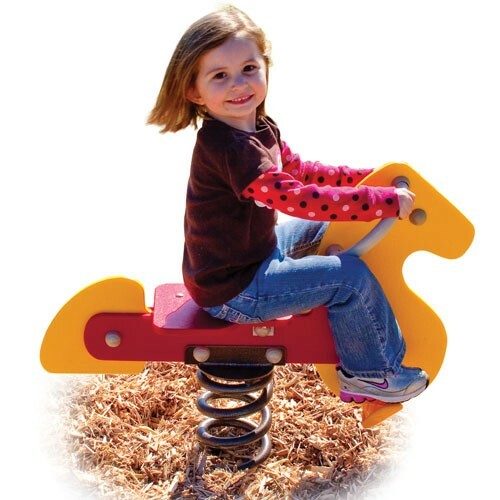 The freestanding Horse Spring Rider is a fantastic accessory for commercial play sets. Kids will love pretending they are riding an actual horse. The Spring Rider will promote social interaction, and imagination. Not only is the Horse Spring Rider fun but it is also safe. The freestanding Horse Spring Rider is a fantastic accessory for commercial play sets. Kids will love pretending they are riding an actual horse. The Spring Rider will promote social interaction, and imagination. Not only is the Horse Spring Rider fun but it is also safe. The spring was made with a Heavy-duty surface mount steel spring, and includes Anchor Bolts for mounting. Additional Mounting options are sold seperately.